Communication is an important element of the strategy of Sarayaku's defense of land rights. Photo provided by the Sarayaku communications team and used with permission. Residing within the southern part of Ecuador’s Amazon region, the approximately 1,200-strong Kichwa community of Sarayaku have drawn international attention for their battles over land and indigenous rights—battles that have relied on worldwide support. Since 1996, when the Ecuadorian government gave concessions for exploration and extraction to corporations without consultation or consent from the community of Sarayaku, its people have fought against oil extraction in their territory. Extraction represented a threat to the land and to Sumak Kawsay, or good living, a community understating of life which, among other aspects, promotes harmonious coexistence between humans and nature. 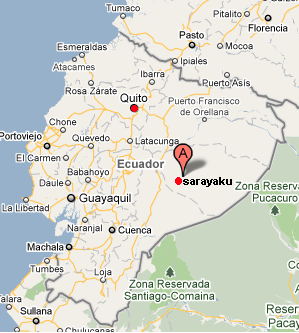 The Sarayaku community took their fight to the Inter-American Court of Human Rights in 2003, winning the case against the Ecuadorian state in 2012. Though the group's struggles are about defending the inherited practices and traditional knowledge of their people, that doesn’t mean they avoid modern methods. 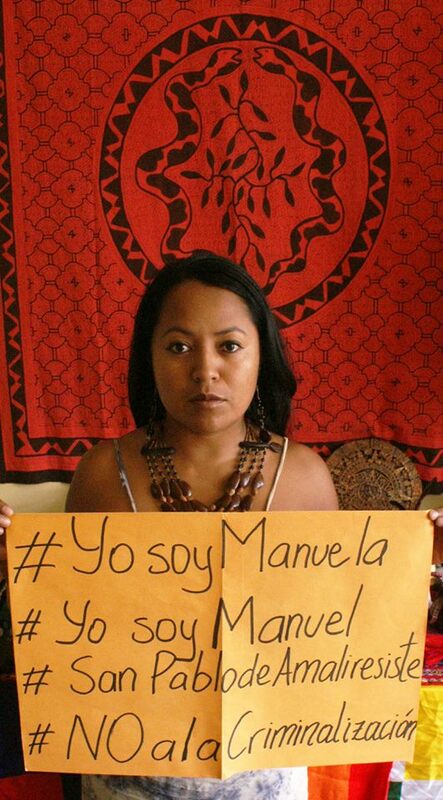 Members of their community and other indigenous leaders recently shared with Global Voices how communications technologies such as the internet have played a crucial role in building international solidarity for their demands. Alguna gente en el poder ha tratado de silenciarnos y nos han privado de la posibilidad de expresarnos con libertad, pero nosotros mantenemos un activismo continuo porque queremos ser respetados y hacer escuchar nuestras voces a través de nuestras luchas. Somos un pueblo que quiere defender su territorio para poder sobrevivir y dejar un legado de resistencia, respeto y fuerza para futuras generaciones. Some people in power have tried to silence us and to deny us the possibility of expressing ourselves freely. We've continued our activism because we want to be respected and, through our battles, make our voices heard. We want to defend our territory so that we can continue to survive and leave a legacy of resistance, respect and strength for the generations to come. The community runs a blog, Sarayaku: El Pueblo del Medio Día. José Santi, one of the people in charge of the blog, told us that as they started realizing that the government and others had different perspectives on the extraction issue, the community quickly acknowledged the need to establish their own channels of communication. El gobierno habla de interculturalidad pero es solo una expresión sin fundamento. No hay un respeto real por nuestra cultura, solo quieren imponer formas de vida externas que no están alineadas con la nuestra. Tenemos mucho que decir y ofrecer y estamos encontrando nuevas vías de comunicación para que jóvenes, mujeres y hombres podamos ser protagonistas de informaciones. The government talks about interculturality but it is just a word without foundation. There is no real respect for our culture, they just want to impose external ways of life that are not aligned with ours. We have much to say and to offer, and we are finding new communication channels so that our youth and the men and women from our community are protagonists in the information produced. The reach of the Internet and other digital communications methods has also been important given Sarayaku’s remote location—the area is accessible only by light aircraft or canoe, after a two-hour drive from the city of Puyo. Internet and mobile coverage in the area is still limited, but community members have employed multiple strategies to encourage the use of online tools. Santi told Global Voices that besides the blog he helps run, they also have a Facebook page and Twitter account to promote their initiatives at both nationally and internationally. Source: Tayjasaruta Official Blog of the Kichwa People of Sarayaku, republished with permission. Andrés Tapia, one of the people in charge of the communication of the Confederation of Indigenous Nationalities of the Ecuadorian Amazon (CONFENIAE), has worked with the Sarayaku for many years. Tapia observed that internet communication provides an important opportunity for sharing information, especially about culture and land rights, not only with non-indigenous people, but also among other indigenous communities. Hay que aprovechar las redes sociales porque tienen la fortaleza de crear nuevas vías de comunicación y complementar las formas de comunicación tradicional como las asambleas. We need to use social networks because they contribute to create new communication avenues and to complement traditional forms of communication, such as community meetings. Hay puntos de vista diversos y los diferentes canales de comunicación nos ayudan a articular estas posiciones y a encontrar maneras de organizarnos para resistir a los proyectos extractivos y a los otros temas que afectan directamente a la población indígena, pero que también afectan a los intereses del país en general. 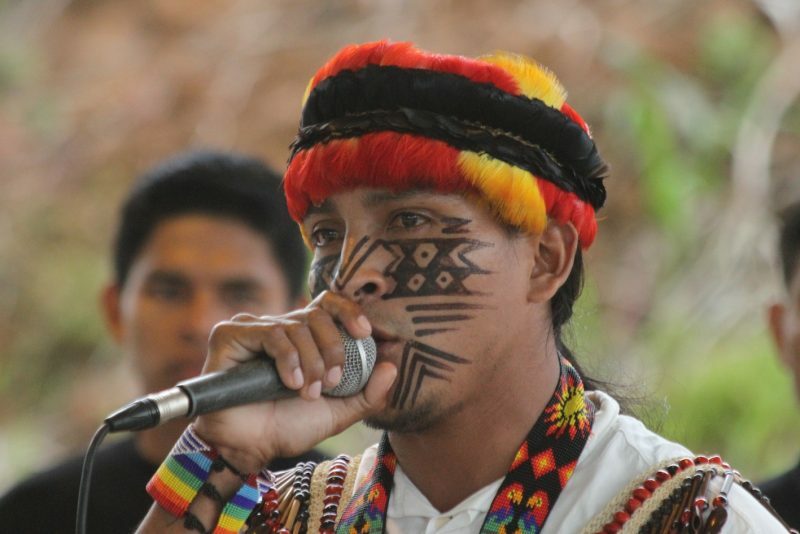 There are diverse points of view and the different communication channels help us articulate these positions so that we organize ourselves and strengthen our efforts to resist extraction projects and the other issues that directly affect the indigenous population, but also affect the interests of the country more broadly. Queremos que las mujeres tomen un rol activo en la comunicación de Sarayaku porque las mujeres somos fuertes, somos valientes, y podemos liderar. Nuestra lucha no ha sido fácil, pero es el legado que estamos dejando a los jóvenes. No queremos que nuestros hijos y nietos vean solo en un libro nuestra historia, queremos que ellos vivan lo que nosotros estamos promoviendo, y sientan lo que nosotros estamos sintiendo ahora para que ellos también se unan a nuestra lucha. We want women to take an active role in the communication of Sarayaku because we are strong, we are brave, and we can lead. Our fight has not been easy, but it is the legacy that we are leaving to the younger generations. We don’t want our children and grandchildren to learn our history only from books. We want them to live what we are promoting and we want them to feel what we are feeling so that they too get involved in our fight. El enfoque siempre es la autodeterminación desde los propios pueblos. No queremos que nadie nos dé hablando sino aliados que nos ayuden a visibilizar lo que nosotros estamos diciendo para así seguir rompiendo fronteras. Our focus is always the self-determination of our own people. We do not want people speaking for us, but allies who who help us render what we are saying more visible so that we keep breaking boundaries in this way. Sarayaku's president, Mirian Cisnero. Republished with permission from Sarayaku's blog, Pueblo Sarayaku, http://sarayaku.org/. Through different projects, local organizations continue to join efforts with Sarayaku and communities facing similar struggles, to look for different avenues and tools to strengthen and share their voices, their acts of resistance, and their experiences, with broader audiences. Stay tuned for more information about our continued conversations with the Kichwa People of Sarayaku in future posts.